The two retail giants have been slugging it out over food and beverage market share for years, with Walmart making recent gains by picking up customers from mainstream grocery stores. Last week, CNBC’s Jim Cramer suggested that Amazon build physical stores to better compete with the Arkansas-based chain of hypermarkets dotting the country. So while Amazon is busy stacking bricks with mortar, Walmart can use insights from SIGNUM for Retail to steal more customers. Focused on retail food and beverage consumers, this chart shows for which interest groups Walmart over- (and under-) indexes, relative to Amazon over the 3 last years. The X axis represents the Index for Amazon compared to Walmart and the Y axis represents the percentage of Amazon buyers that have that particular interest. In the upper-right-hand corner, Science Fiction enthusiasts are a large group with a 2.0 index. 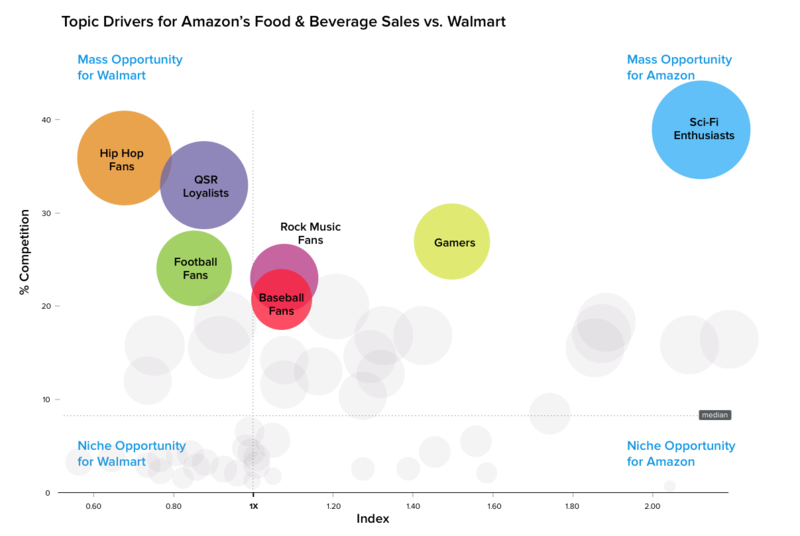 This means that sci-fi fans are 2x more likely to spend money on food and beverage at Amazon than at Walmart. This of course makes sense, as science fiction fans are already quite loyal to Amazon after years of buying books there. Walmart should probably not waste resources trying to market to those folks. In the upper-left-hand corner, Hip Hop Fans are firmly in the camp of Walmart when it comes to food and beverage. For Amazon buyers, hip hop carries only 60% of the importance it does among Walmart buyers. This also makes sense as hip hop fans are quite loyal to Walmart after years of buying music and clothes there. Walmart should not waste time defending this audience. The interest groups hovering around the Y axis are consumers up for grabs. Rock Fans and Baseball Fans each show about equal preference for Amazon and Walmart. The battle for retail food and beverage supremacy could be decided by these two fairly large groups. How might Walmart use these insights? Knowing what Interest Groups are on the frontlines of the battle against Amazon for retail share of stomach, Walmart could activate media to those audiences on Facebook and beyond. Walmart could also conserve money with groups who have already made up their minds, and use the data as a competitive advantage against Amazon as it eats into its own customer base. While Amazon and Jim Cramer debate wall-building, Walmart can double down on its digital success with an intelligence layer atop the specific category's buyer data and target baseball and rock fans.